Mr. Mahalingam C, Managing Director, Lead Theatre Consulting, Bangalore, the technical session speaker the first session of the International HR Conference 2018 held on December 14, 2018. Mr. Mahalingam started his speech by stating that “Leadership is all about continuous purification and not glorification”. He said organisations need to reinvent themselves every decade or as and when required to thrive and remain relevant. He mentioned that agility, resilience, bold action and integrative thinking are imperative in today’s digital world. Mr. Mahalingam concluded the session by explaining how digitalization is altering business models and how it is necessary for organizations to reinvent themselves. Dr. M.R. 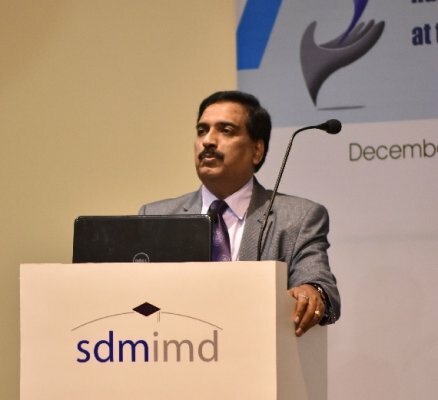 Suresh, Professor – Marketing, SDMIMD, chaired the session. A one-day pre-conference workshop on HR Analytics was held on December 13, 2018. The workshop was aimed at discussing the latest trends in Human Resource Management and application of analytics. Inaugurating the workshop, Director, SDMIMD, Dr. N.R. Parasuraman, enunciated the importance of the best practices in leadership and culture in the context of modern HRM. He highlighted on practical aspects of HR management and how conventional theories did not sometimes hold good, in his session. Resource persons, Dr. Mousumi Sengupta elaborated the concept of analytics in Human Recourse Management with case applications. Prof. M. Minhaj explained the use of Analytics in business. Dr. Nilanjan Sengupta shared his thoughts on linking Human Resources to business as a strategic business partner to maximize the stakeholder value. Faculty members, research scholars and students from various academic institutions in Karnataka and other states participated in the workshop.